Power soccer, one of many popular wheelchair sports, began in different countries around the world in the 1970s and 1980s. In Canada, electric wheelchair users developed a form they called “motor soccer” This was later imported to the U.S. by a sports program for people with disabilities organized by university students in Berkley, California. Eventually, coaches from the around the world discovered the different variations of the sport in other countries. The United States Power Soccer Association was formed in 1996, and the United States joined many other countries, including France, Japan, England and Denmark to form the Federation of International Powerchair Football Association in 2006. Today, power soccer is one of the fastest growing sports. There are hundreds of teams and programs in the United States that offer recreational and competitive power soccer. The objective of power soccer is for players to use their wheelchairs to maneuver the ball and score on the opposing team’s goal. To be eligible to play, individuals must use a power wheelchair in their daily life. Power soccer players may not have the ability to play another wheelchair sport. Both girls and boys over the age of five can participate in the game. Power soccer is played on a regulation-size basketball court with an oversized ball. Each team has four players on the court, with one player serving as goal keeper. The game consists of two, 25-minute periods. 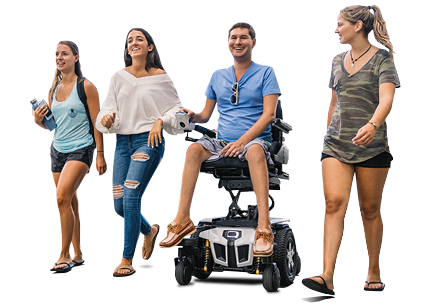 In terms of equipment, rear-wheel drive, mid-wheel drive and front-wheel drive electric wheelchairs are all acceptable to use on the court. It is recommended that power elevating footrests are removed from the motorized wheelchair and replaced with standard footrests during the game. Each electric wheelchair is fitted with a soccer guard. This specially-designed bumper temporarily attaches to the footplate of each player’s motorized wheelchair. Players use this to maneuver the ball on the court. The bumper also protects the players’ feet and prevents damage to the power wheelchairs.